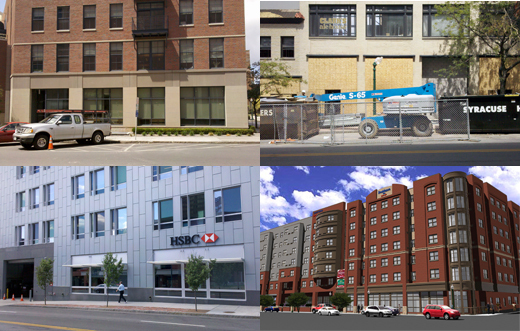 Just yesterday, it was announced that the stop-and-go Mariott Hotel project in Armory Square is yet again in go mode. This is good news, no? Design-critique aside, it most certainly is good news for downtown, as another surface parking lot is vanishing in favor of a dense development. To make it possible post-economic meltdown, the scope of the project has been scaled back it seems, according to this article in the Post Standard. It has been reduced from eight stories to seven, a respectable size while still retaining the room count, but there's something troubling about the following phrase that reads "eliminating retail space." I've already expressed the importance of an active urban ground floor in an earlier post, but I'll reiterate the most important point: active and engaging ground floor spaces [retail is the most prevalent form of this] encourage people to explore the city streets and feel comfortable while doing so, whereas introverted ground floor spaces [offices, vacant spaces, blank walls, etc] don't provide anything interesting for a person and therefore offer no incentive to keep exploring in that direction. In this case, "eliminating retail space" sounds exactly like the wrong thing to do, especially in an area of downtown where retail is at a premium and is drawing more and more people [and therefore new retailers too] on a consistent basis. Sure, there will be guests coming and going from the hotel, but there will otherwise be no interaction by the typical person out for a stroll. This north edge of Armory Square, on the ground floor, will be no more active than before. "Great assessment. Eliminating retail is a short-sighted decision by the developer and the city should not have approved the tax deal - this is a significant material change to the original plan, and one that will be far less beneficial to the neighborhood. 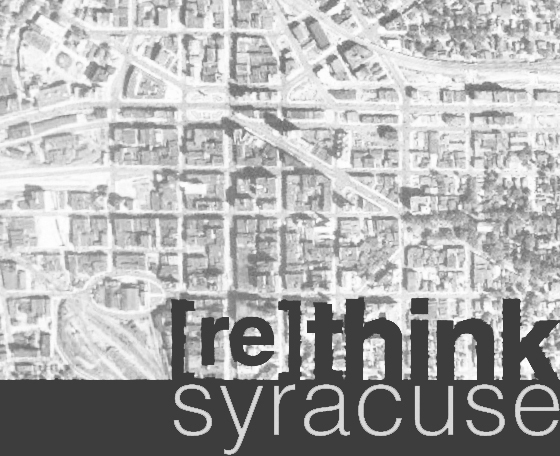 I don't buy the argument that there is no need to enliven the streetscape north of Franklin because the federal building and National Grid already have created a dead zone in that area - that is more reason to build street-level retail north of Franklin and invite pedestrian movement on those blocks."